In small bowl, mix tomatoes, onion, cilantro, chile, lime juice and salt. Set aside. Arrange lettuce leaves on serving platter. 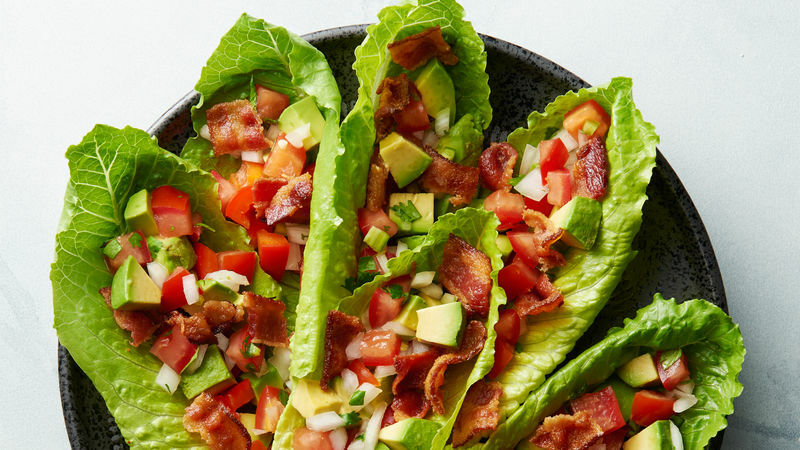 Divide avocados and bell pepper among lettuce leaves. Top with tomato mixture and bacon. To dice avocado, cut in half, and remove pit. Using large spoon, scoop flesh from skin. Place one half avocado cut side down on cutting board. Make two horizontal cuts to make three planks, then cut lengthwise into strips. Turn 90°, and cut again. Repeat with other half of avocado. Want more spice? Add 1 additional teaspoon finely chopped serrano chile.